Colour is widely believed to have a profound impact on psychology and mood, so if you want to create a relaxing sleep environment, colour is a key player. Soothing neutrals and soft pastels are naturally more serene than ultra-vibrant hues. In fact, a study conducted by Travelodge found that people sleeping in rooms decorated in calm colours received the best night’s sleep. Consider white and cream, pale blues, yellows and greens and soft blush pinks. A serene room is free from troubles, worries and distractions; this means no from unnecessary clutter or work! 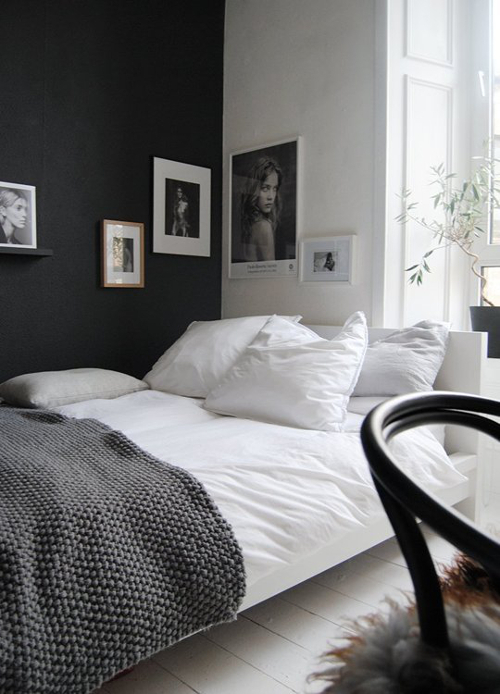 Even the most ardent hoarders will benefit from practicing minimalism in the bedroom. Keep only what you need – a bed, nightstands, a place to store clothes, perhaps a dressing table and chair for getting ready each day. Leave out any clutter from the rest of the house; no paperwork or toys, limited technology and if there’s space for it elsewhere, no dirty laundry either! If you can’t indulge in a little luxury in the bedroom, where can you? We spend approximately a third of our lives sleeping so we deserve to sleep in maximum comfort. Invest in a really high quality bed frame and mattress – it’s good for your health! Even things like pillow quality, duvet thickness and the material your bedsheets are made from will better your experience. Spend some time working out what you find most comfortable, and treat yourself! Bedroom lighting should be both multi-functional and ambient. You need good task lighting for things like reading in bed or doing your makeup and soft lighting for when you’re winding down. Consider multiple light sources; a direct overhead light and bedside lamps with diffusing shades for a soft glow at a minimum. You can add extras like strings lights for a romantic atmosphere, or a desk lamp for your dressing table. Scent is a very powerful thing. It can aid in reducing anxiety and stress, and help you sleep better. Lavender is the most popular essential oil for relaxation but other famously relaxing scents include chamomile, geranium, coconut and tangerine. Use diffusers, scented candles or dab a little oil directly onto a handkerchief and place it on your pillow. December 17, 2015 in Inspiration and Theory.